Today was the day of closed Interstate on ramps. Leaving the hotel in Dayton, I followed the Gee Pez (Swedish for GPS). I was supposed to get on to I-75, a little over a mile from the hotel. The on ramp was closed – bummer. OK, that’s what a GPS is supposed to be for - finding your way. Therefore, I pushed the recalculate button and the lovely voice tells me to head a different direction. The directions wind me around Dayton and eventually put me on onto I-70, which was OK because that’s where I supposed to end up. Instead of taking 5 minutes to get onto I-70 it took about 25 minutes after the grand tour of the outskirts of Dayton. So, off I go, heading to Chicago and then on to Madison, WI. The rest of Ohio was pretty unremarkable, and the temperature wasn’t too bad – mid to high 70’s and the humidity was bearable. Then I got into Indiana. Stayed on I-70, around Indianapolis on I-465, and then on to I-65 to Geary, then onto I-90. I picked up I-465 at indianapolis. It is long, flat and straight. The temperature got up to the low 90’s, but pretty low humidity still. Getting onto I-90 at Geary was part two of closed on ramps. So, the lovely voice in the Gee Pez gave me another set of long round about direction to get to I-90. But, it’s better than going in circles for two hours. Chicago traffic is a real treat – what a zoo. 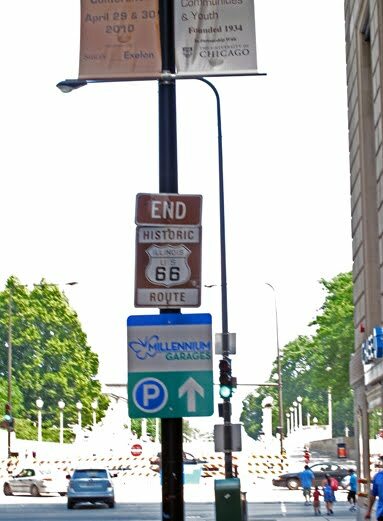 Since I was going to pass right through Chicago and I’d be very close to the start (or end) of The Mother Road I took a small diversion to start / end of Route 66. The start of Route 66 has moved a few times. Originally, Route 66 began on Jackson Blvd. 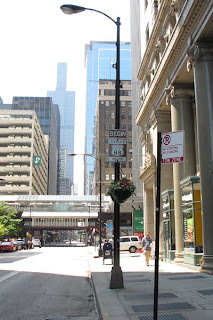 at Michigan Ave. In 1933, the start (and end) was moved east onto the reclaimed land for the world fair to Jackson and Lake Shore Drive. 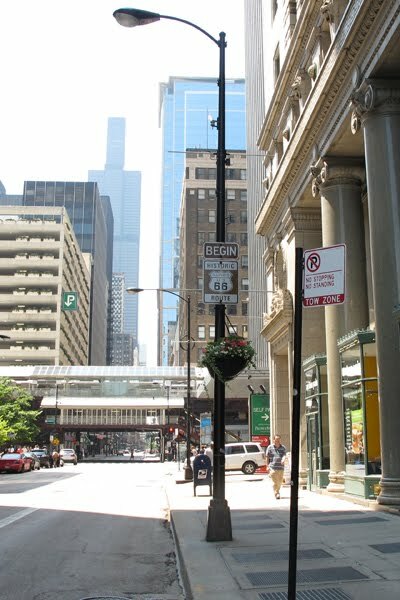 In 1955, Jackson Blvd became one way west of Michigan Ave. and Adams St. became the westbound US-66. However the start of US-66 remained on Jackson at Lake Shore Drive. The ending point is easier: post 1933 at Jackson Blvd. and Lake Shore Drive; prior to 1933 it was at the intersection of Jackson Blvd and Michigan Ave. (which is marked as the terminus). After the diversion I headed North to Madison. The temperature got up to 96 degrees on I-90 heading out of Chicago. I’m not sure if that was the air temperature of just the heat from all the cars on the Interstate. After getting into Wisconsin, the sky started to gray up and the temperature dropped 10 degrees. There was rain off in the distance, but I only got a few sprinkles. 450 miles and safely at the hotel.